Nowhereman Brewing’s Lager Party WA Beer Week event with Blackman’s Brewing offered the perfect opportunity to collaborate. So, on that warm November evening, as Renn Blackman and Nowhereman head brewer Paul Wyman sipped the clean drinking delights of bottom fermentation, their efforts from earlier in the day were beginning to bubble. Prior to starting out in the pro brewing game, the collaborators had been to beer school together and previously worked together at The Monk, in Fremantle, too, picking up Best Draught Ale at the Perth Royal Beer Show for The Chief, a beer that started out as a Citra hopped American IPA then evolved into a rotating affair focused on lupulin creativity. Fast forward to 2017 and it seemed only natural to riff on this theme again. Coast to Coast channels this hoppy love affair into a citrus and pine IPA – remember those? Three types of Crystal malt were used to create layers of caramel and burnt toffee for the Centennial, Citra, Simcoe, Amarillo and Cascade hops to work their magic on. The mix of hops also extended to using a variety of delivery methods including pellets, powder and oil. Despite being unfiltered, the clarity of the beer is impressive and, while the 75 IBUs certainly packs a punch, it’s not at the expense of drinkability. 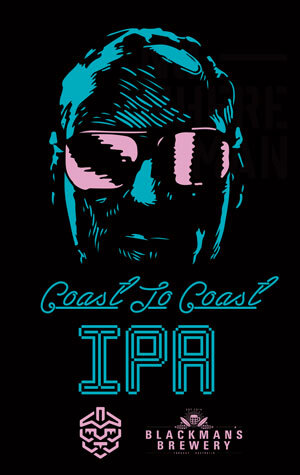 The draught only Coast To Coast IPA is now pouring from Nowhereman, with kegs en route to Blackman's Brewery as these words are being typed.